There is no doubt that the Spanish are a few steps ahead of everyone when it comes to youth development right now. Having taken steps to re-organise the country’s grass roots structure back in the 90s we are now seeing the emergence and dominance of an array of extremely talented Spanish players. Mata, Cazorla, Fabregas, Xavi, Iniesta, Busquets, Villa, Michu and Silva are just some of the world class talent currently lighting up the top leagues in Spain and England. At this point in time it seems that every season brings with it a previously unheard of but wonderfully talented young Spanish midfielder, able to pass his way out of the tightest situations using any part of both his feet with skill, balance and seemingly 360 degree vision. In Barcelona and the Spanish National team we are currently witnessing two of the greatest teams to ever to play the game at their respective levels. It all points to the fact that the Spanish have understood what it takes to develop talent, and whilst doing so, are re-inventing how the game should be played. In England, we have been a little slow to catch-up but with managers such as Brenden Rogers and Michael Laudrup now gaining success emulating the methods employed in Spain and with the growing dominance of the Spanish and the Germans in the Champions League, we are starting to see the beginning of change in Premier league as teams begin to understand the importance of keeping possession. At 5Ways Soccer, Brighton we have long believed in the virtues of passing possession youth football so are glad to see the roots of change taking hold and are happy to present this fantastic article detailing the ideas behind Tiki-taka and why as a nation we need to get away from the “hump-it-up-the-field” long-ball tactics that have been a feature of English football at Premiership and Sunday Youth league level for so many years…. Enjoy. Football coach and blogger Jed Davies examines the ‘Tiki-Taka’ philosophy deployed by Barcelona under Pep Guardiola and Swansea under Brendan Rodgers. This piece was originally published on www.thepathismadebywalking.wordpress.com. The ‘long ball’ tactic was first conceived in the 1950s by theorist Charles Reep in England. Reep was a football enthusiast and analyst who studied in great lengths the number of passes that led to a goal and what positions the key passes took place. Optimum position for an assist: between the corner flag and six yard box. An approach that led to chance creation as often as possible to score goals. The product of this is the 4-4-2 system or any variation of this (4-2-4 etc) that requires wide wing play and balls being played over the midfield to the striker to knock the ball down to the midfield in a more advanced position on the field. This formation would eventually lead to the defensive minded players playing midfield to be exceptionally good at winning the ball back and playing a short pass into a player who could then start the route one style of football: the ‘Dunga/Makelele role’. The long ball system makes sense and requires a set of very particular players to fit the perfect mould for each role. The system is perhaps far more successful over the course of history compared to the ‘total football’ of Holland’s 1980s team or the fluent passing Brazil of 1970, Argentina of 2006 etc. Football evolves over time. The requirements of a modern day football are in stark contrast with those of the 1950s and 60s. Players are now expected to run much further than before, the ball is now lighter and can be manipulated in ways it simply could not before. Spain won the European Cup in 2008 and World Cup in 2010 without players that fit the ‘long ball’ mould. They won the tournaments playing ‘Tiki-Taka’ football, a type of football that has found its roots in Holland’s ‘total football’, but this time instead of a system that allowed players to interchange positions fluently it turned its focus on the fluency of possession and the very importance of it. This approach aimed to control both the ball and the opposition. “I like to control games. I like to be responsible for our own destiny. If you are better than your opponent with the ball you have a 79 per cent chance of winning the game – for me it is quite logical. It doesn’t matter how big or small you are, if you don’t have the ball you can’t score. The formation is nothing new; however, it’s the way in which each player is used within the formation that allows the approach to work. 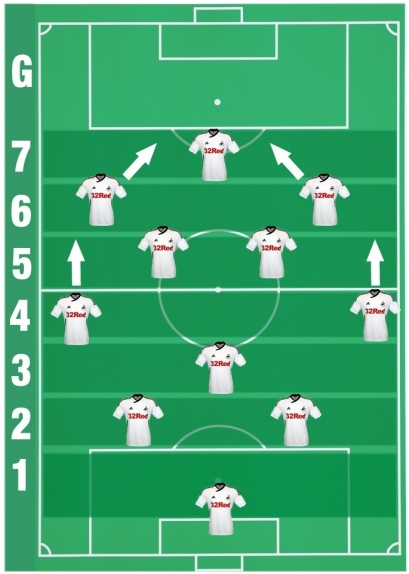 Therefore an adjustment must be made in the traditional view of this formation from a 4-5-1/4-3-3/3-4-3 to a 1-4-5-1, 1-4-3-3, 1-3-4-3 or even a 1-2-6-1. The point here is that the formation has lost its simplicity of which it can be viewed. The formation is now one not viewed as defence, midfield and attack but instead, over seven zones of the pitch. Barcelona use a similar system: many noted their recent change in formation from a 4-3-3 to a 3-4-3 with the introduction of Cesc Fabregas, but the truth is they have not really changed formation as much as many have been led to believe. The centre-forward, creative inside wingers and attacking wing-backs have been consistent features of many formations throughout generations and their roles do not change with much significance. It is the role of zones 1, 2, 3 and 5 that act as the core to the build-up play and the success in retaining possession over the entire duration of the game. Lastly, it is important to remember that ‘the whole is greater than the sum of its components’ and the entire team, despite set into separate divisions of the field, is expected to work together; to move up together and backwards together, much like the waves of the ocean crashing onto the surface of the beaches. As mentioned before, absolute belief that each player will do the right thing is vital – therefore meaning players will not wait and watch their pass reach a teammate’s feet, but pass and look for space for yourself, trusting not just your teammates but your own ability to pass and that it will reach the teammate you aimed for. The ideal is that every player will have constant awareness of every other teammate’s positioning and offer themself as a passing option whenever possible as many times as possible. As a general rule, players should look up around every 5-10 seconds to give themselves three options before they get the ball, this way the players are never caught out in possession. Expect the ball at any given moment. Therefore, all players are expected to defend from the front and learn to keep men behind the ball as much as possible. This approach also allows the ‘keeper to act as a sweeper when the opposition attempts to play high balls over the high back line. A contrast in the older approach that defensive players do their duty and the attack wait to counter when their teammates win the ball back. The alternative to high pressure, if the players you have struggle with fitness, is the complete opposite. To site back and tackle only in your own half and invite the opponents to try and play their way through you. Taking inspiration from basketball’s approach of dropping back and protecting ‘the key’. This will encourage the opponents to either play long ball and give the ball back more often than not or encourage the opponents’ defence to become play makers. They are often not the best passers and this will lead to mistakes being made. It is important, however, not to get carried away with the counter attacking approach after winning the ball back in deeper positions. Patience and the changes in tempo are key. Total knowledge and understanding are a good place to start alongside the ability to keep the ball for youth football in the UK. 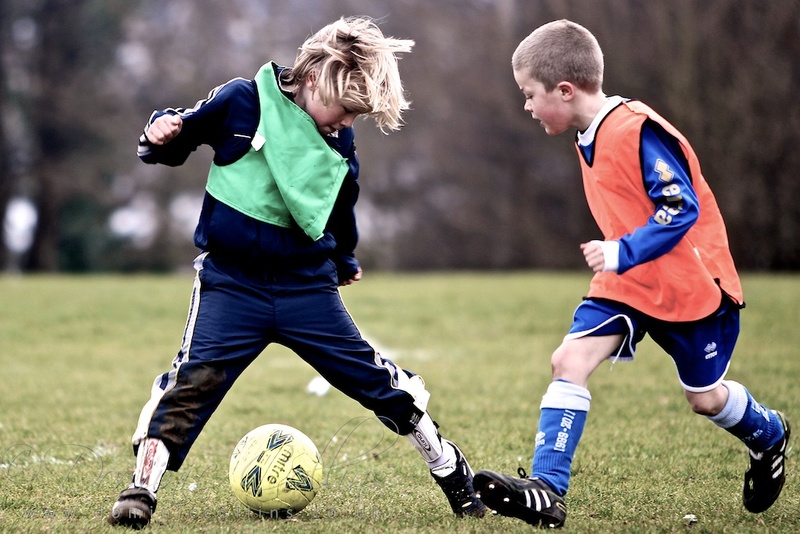 Many children are playing in teams not quite understanding their roles throughout the UK. An important factor of successful creativity and development is not to punish mistakes, but reward successes. When one is punished for attempting to create, they will refrain from successfully creating in the future because they fear failure. Many coaches in youth football today are killing creativity and taking the good out of the naivety of the youth. A handbook should be given to each player not only explaining the roles of their own position but the roles of all other positions to get the full concept of Tiki-Taka football. Identifying your own youth players’ skills and potential is key in the selection of roles within the zones when in possession of the ball. Practice will make perfect. Perfect football is achievable. Maybe one day Sunday league football will be enjoyable to play in for every position on the field. We might fail at first, but progress is made through failure. 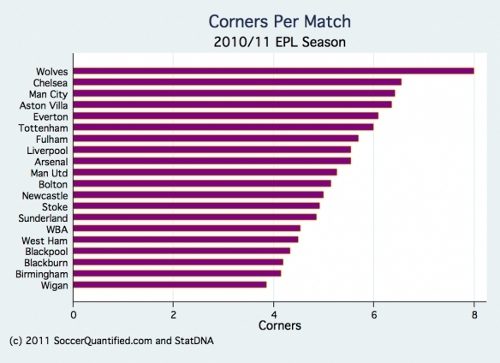 “Here are the overall numbers of corners per team in this sample of matches. 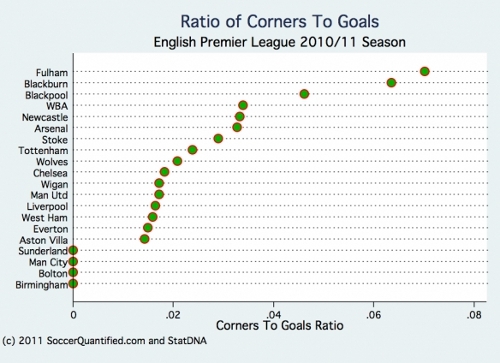 On average, teams took 5.35 corners per match. This is consistent with the five-year league average of 5.52. While Wolves were particularly high at around eight in this sample (for the season as a whole this year, they are at 6.2 – also quite high), the rest of the teams ranged between a low of about four (Wigan) and six (Chelsea), with the better performing teams this year producing more corners. While this is not what we’re primarily interested in, it gives us a baseline against which we can compare the shot and goal production from corners. So here is the answer to question one: what are the proportions of corners actually producing shots on goal, according to the StatDNA data? The data show that, on average, about 20.5 per cent of all corners (that’s one in five) led to a shot by the team that took the corner within three touches of the ball. There also is considerable variation across clubs on this. At the low end, some of the very best clubs in the league managed relatively few shots – about one to 1.5 in 10 – relative to the number of corners they produced. In contrast, some of the worst teams in the league produced a relatively high number of shots in the aftermath of corners (Chelsea is the exception), at a rate of one in four or even one in three (West Ham and Stoke). There is even greater slippage when it comes to turning shots into goals than turning corners into shots. In fact, it’s almost twice as much. 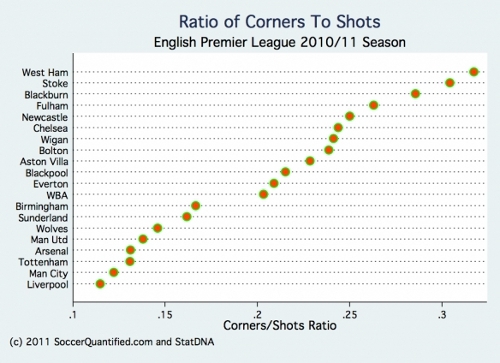 On average, about 11 per cent or one in nine shots created from corners produce goals. Incidentally, that’s also right around the average ratio for goals to all shots taken in soccer matches (the Reep ratio). In this sample of matches, Fulham and Arsenal led the league in converting corner-created shots into goals at a rate of over .25, while at the low end, none of the shots created by Sunderland, Man City, Bolton or Birmingham found the net. So what do the patterns look like when we put all this together? 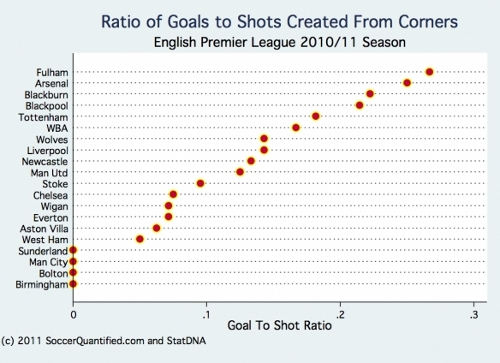 The graph below of the ratio of corners to goals tells the combined story. From the data above it has become increasingly clear that at top level football, where defences are well organised, set pieces are a case of improbable chance more often than not. A corner is no longer a regular goal scoring opportunity in reality; therefore, as an alternative approach, perhaps a corner should be thought of as opportunities to maintain possession in the final third of the pitch, or if you are the defending side, the opportunity to counter attack. Obviously, if you have a team of giants (Norway/Denmark in previous years) with the combination of an excellent corner taker – which is rarely found even in professional football – then a corner is by all means a real goalscoring opportunity. As a regular Cardiff City match attendee I can safely say I have only witnessed a handful of goals scored from corners over the last five years, despite possessing Peter Wittingham, a player considered to have the best technique outside of the Premier League, and players such as Roger Johnson, Jay Bothroyd, Mark Hudson, Ben Turner amongst others who are all proven threats in the air. Cardiff have found far more success from indirect free-kicks and long throw-ins over the last five years. So perhaps a corner needs to be reconsidered entirely and a short ball should be played, freeing up the 18-yard box and starting the attack again rather than launching the ball into their goalkeeper’s hands and allowing the opponents to break. The implications of this would by and large be huge. With only a handful of players either standing in or around the opponents’ area, a corner would no longer become the opportunity for hectic movement inside the box, but an opportunity to re-start in an opponents’ half with players tactically scattered over the final third. The opportunity to make and create space to then play the chance creation ball in a moment of chance creation opportunity would be asking a different set of questions to your opponents. Perhaps less is more in this sense. This guide does not suggest that this is the best approach by any means, but questions a part of the game that most professionals at the top end of the game right through to Sunday league footballers take as a given. “We’ve won a corner, now send all the big lads forward.” Maybe the complete alternative is better? There is, however, something about scoring a last-minute equaliser from a corner against a team who have outplayed you from start to finish (see Ben Turner’s last-minute equaliser against all odds Cardiff City v Liverpool Caring Cup final 2012), but perhaps that’s all it should be, a desperate chance against a team who you cannot outplay another way. It is worth noting that (from experience) in youth football and in the lower leagues, corners have a much higher success rate and quick counter attacking football from one end to the other does not happen so frequently. Of course, there is no right and wrong in football, and this handbook should most certainly not be given as a blueprint for how to play. Tactics and football itself are always evolving – Barcelona have changed their set-up every year for the last three years despite being labelled as the best team in history. Do you find a formation that fits the qualities of your players or ask your players to fit the mould of a style of play and play their part in doing so? As with most things football, the answer to this question is a highly subjective one. No one is saying that one method is more successful than another: from Stoke to Barcelona (albeit one club is clearly more successful here), it’s all football. But, if I were to answer the question of what football is about for me, as a player, a coach or a fan, I know for certain which style of football I’d like to see being used. However, the objective of the game is to win and with winning you’ll find the secret to the enjoyment of the game. Just ask Greece of 2004 and Italy 2006 whether they’d swap those trophies for the trophy-less but praised history of the Netherlands. Brendan Rodgers is a man who has an appreciation of footballing perception and culture, regardless of its roots. He is a man who strives for perfection in the evolution of the game. 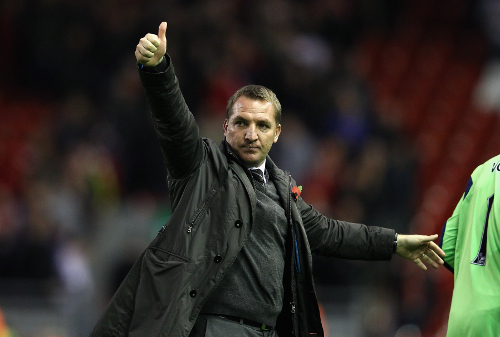 The strategies of ‘Tiki-Taka’ and ‘totaal-voetbal’ form the basis of Brendan Rodgers’ modus operandi. 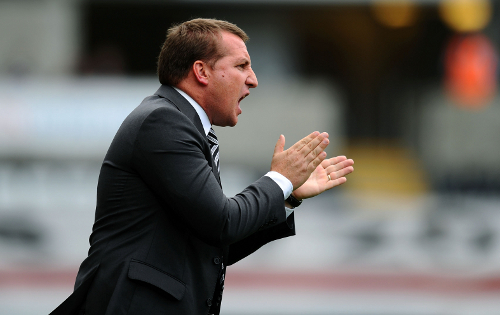 For Rodgers, the season of 2011-12 will be regarded as the touchstone for 2012-13. This time however, he’ll be upgrading the apparatus with which he conducts his orchestra. This article aims to reveal the ‘magic’ ingredients Brendan Rodgers prepared his Swansea class of 2011-12 with. 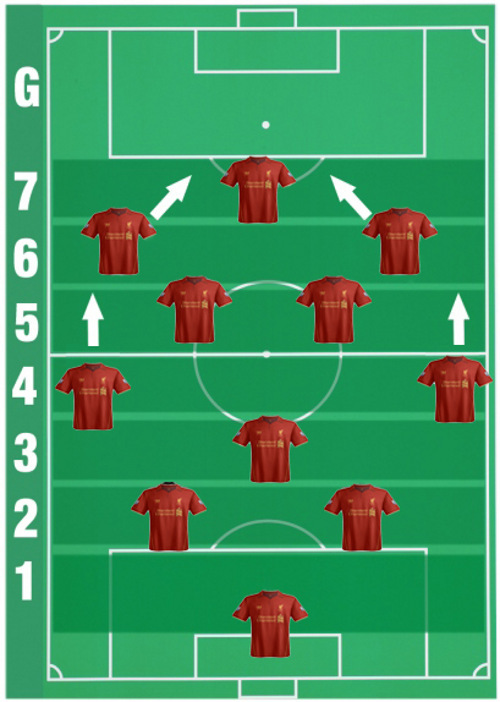 The formation moves away from the given 4-4-2, 4-3-3, 4-5-1 etc. way of thinking and towards a concept of zones within the playing field. This specialised zone is expected to take charge of a much larger zone in Tiki-Taka football compared to the more direct approach. The emphasis is on the goalkeeper to play with the ball at his feet and play far more short threaded passes than usual. Characteristics in this role include: good stature, efficiency with balls in the air, bravery, agility and willingness to play on the deck without fear – the ‘keeper is expected to act as a pressure relief for under pressure team mates. Given that Liverpool’s Reina received his education at Barcelona’s La Masia it will come naturally to Reina to play the required role in Zone 1. The players in Zone 2 are, like the goalkeeper, expected to play a much larger role in ‘keep-ball’. They too are expected to act as pressure relief to a compact midfield as a way-out option. The two centre-backs are expected to complement one another: one technically brilliant and one with a powerful physical presence (see: Puyol-Pique). The more technical of the two is to act as a playmaker for changing the pace of the game – Ashley Williams made more long ball attempts than any other outfield player during 2011-12. As a ‘libero’ you have the whole picture in front of you – you are in a position to say, ‘let’s go this way’ or ‘let’s go that way’. 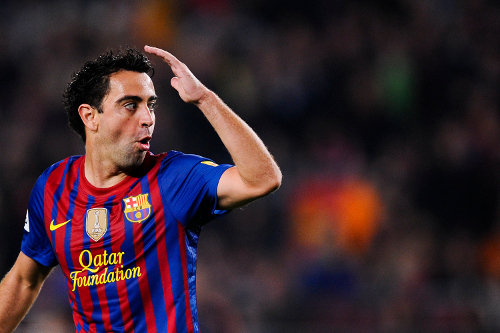 Xavi’s hypnotic approach to the game summarises the mindset for the player in this particular zone and, like Leon Britton, should boast a remarkably high pass completion rate. The players in this zone will need to be prepared to work particularly hard, up and down the wing; both defensively and in more advanced positions. It is important to note that crosses will now be made from the by-line rather than from deep. Liverpool currently boasts a number of players who can fulfil this role like Glen Johnson, Martin Kelly and Jose Enrique. Flair, the ability to change the pace of the game within a second and an all-round technical ability are required to fulfil the roles in Zone 5. These players are expected to continually find space amongst the ‘traffic’ and complete the triangles in possession. The players should not constantly look to create the spectacular but are expected to simply knit the possession and keep the ball more often than not. Messi, Alexis Sanchez, Sinclair, Dyer all represent the highly creative, technically gifted and unpredictable type of player expected to fulfil the requirements of this zone. Luis Suarez is one player who could walk into the Barcelona model and will no doubt provide Liverpool with much of the answers in this zone. This player is expected to be technically gifted when assessing his first touch, link up play and off ball movement. Carroll may well represent a target man, whether or not he adapts to act as a target man in this model is a question yet to be asked of him. Towards the end of the 2011-12 season, Carroll showed glimpses of being an extremely hardworking forward and may well find much success in this role. Anyone lucky enough to watch Fabio Borini will know that he was a huge loss to Swansea this past year, despite the success of Danny Graham. This zone is a vastly important zone to understand. The quality of chances cannot be stressed enough. Liverpool has, over the past five years, been noted for creating chance after chance without scoring. The players who break into this zone should be extremely good at making the decision as to whether a goal-scoring opportunity is available or to turn back and play the ball back into the organism of Tiki-Taka. Barcelona however, highlighted the danger in over-relying on this concept; their play became slower and more predictable as the game went on against Chelsea in the Champions League 2011-12. For situations like this, maybe Steven Gerrard will recreate the brilliance he showed against Olympiakos in 2004 and West Ham in 2006. However, a balance between the Tiki-Taka patience and Gerrard’s direct play will be reworked under Rodgers without a doubt. As a general rule, one goal should be scored to every nine shots. Whether or not Rodgers’ methodology is a success at Liverpool is the question but Liverpool have kept no secrets in their approach to managers and directors this summer but all roads point to one single conceptual view of football – that of Barcelona and La Masia; the hope of becoming a successful club in perpetuity. 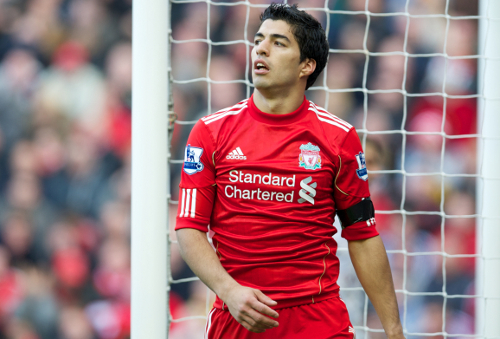 The variable of ‘time’ presents Liverpool with the biggest challenge. ‘Tiki-Taka’ football simply does not come about after one single season of change. Swansea were already a technically gifted side and good in possession long before Brendan Rodgers. Both Paulo Sousa and Roberto Martinez provided the club with the foundations. The core of the Swansea side has been with the club for many years. ‘Tiki-Taka’ has become the club’s tradition. Progress and longevity are the goals of Liverpool and Brendan Rodgers and it is this collaboration of ideologies that may well lead Brendan Rodgers and Liverpool back to the glory days of yesteryear. …tú sabes (you already know). This piece was originally published on www.thepathismadebywalking.wordpress.com.